Posted in News on March 4, 2019 by erik.rasmussen@noaa.gov. The “Meso18-19” field project of VORTEX-SE held its sixth Intensive Observing Period (IOP) of the tornado season on 2-3 March 2019. Sadly, a long-track EF4 tornado in this event killed at least 23 people in Lee County, Alabama. As I write this, several NWS offices are conducting damage surveys in Alabama, Georgia, and Florida, and it may be a while before we know the final tornado count. As I watched this event unfold, I saw numerous radar signatures of what appeared to be fairly significant tornadoes, with strong velocity couplets and debris signatures. We first noticed this event taking shape early in the week, as the European forecast model showed a pattern of strong low-level winds and substantial CAPE centered roughly in the Tennessee River Valley region. At that time, the U.S. forecast models were not showing any suggestion of this pattern. So we went into “IOP WATCH” mode to see if the models would come into more of a consensus regarding the threat. With time, the US models did start moving toward a more threatening forecast, so we had (barely) enough confidence to declare IOP #6. Recall that our general plan is to observe the atmosphere for a full 48 hours, ending when the severe weather ends or departs our domain (this roughly means moving east of an Atlanta-Tallahassee line). And we need 48 hours to line up the personnel, resources, and accommodations to make our observations. So we have to commit ourselves to the plan at roughly day4-5 of the SPCs Convective Outlook. This is, frankly, pretty stressful because of the huge uncertainy that is generally present in a 96-hour forecast of tornadoes! As the event approached, we started turning our attention to the “Convection-Allowing Models” (CAMs) such as the HRRR, the NAM-3km, and other similar models. We looked at the “UH tracks” (this stands for Updraft Helicity, a measure of the rotation of the updrafts in the model). We started seeing ominous signs of tornado threat with tracks across mainly Alabama, and a few into Georgia. By Saturday, it became clear that the threat that first caught our eye in the European forecast model was real, but that it was going to be shifted much closer to the Gulf Coast. We began our special soundings from our university and NOAA-lab operated sites, and 13 NWS regular sounding sites, at midday Saturday. 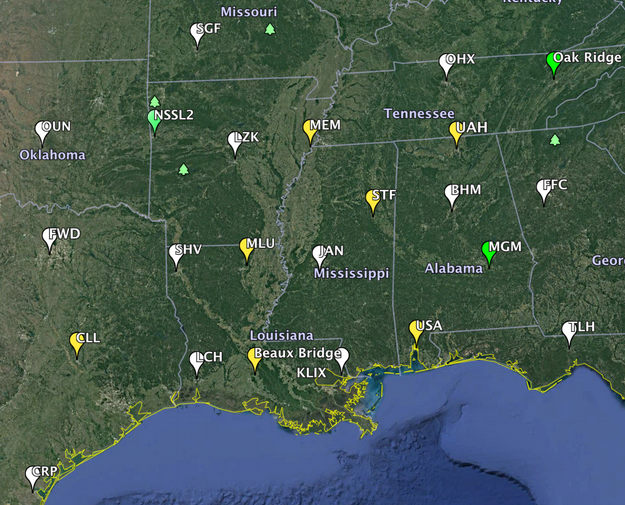 At that time, there was no CAPE or shear supportive of tornadoes to be found in the Southeast. The upper system was just moving into the Southwest US. By 6 AM Sunday morning, the potentially unstable air was just beginning to come onshore from the Gulf of Mexico, first showing up in our Breaux Bridge, Louisiana soundings (conducted by the University of Louisiana-Monroe), and the Slidell LA NWS sounding. An additional sounding in mid-morning from our team at Mobile, AL (University of South Alabama) showed the rich airmass onshore in Mobile at that time. And by mid-morning Sunday, the big acceleration in the low-level winds across MS and AL had begun, so it was just a matter of time before the tornado-supporting flow and the rich Gulf air near the ground started overlapping in southeast MS, southern LA, and southern GA. This season has featured a very large temperature contrast between the continental U.S., where many of us have been shivering, and the warm air masses to the south (such as over the Gulf of Mexico). This temperature contrast drives the strong westerly winds aloft and their embedded waves, and so we have repeatedly had strong low pressure systems capable of bringing warm humid air onshore and strong low-level wind shear supportive of tornadoes. Yesterday’s system brought together the strong shear with a bit higher CAPE than we have seen with the other systems, and the result was devastating. Unfortunately, there is no real end in sight to this energetic pattern. During yesterday’s event, VORTEX-SE special soundings were being used by forecasters at the Storm Prediction Center and at the NWS forecast offices to help anticipate the degree of tornado threat. I was very impressed with how well forecasters were able to fine-tune the short-term outlooks and provide quality warnings. The sad loss of life tells me that we have to continue to work on making sure everyone understands, and is able to respond to, the information coming out of the NWS and communicated so effectively by the media and others. VORTEX-SE stands to learn a lot from these events. We will get a clearer picture of whether/not/how additional observations can improve the numerical forecast models. With time, it’s almost certain that the forecast models can show tornado threat and even estimate likely tornado intensity with lead times of hours. That is the goal, anyway. The VORTEX-SE work is important in advancing this capability. 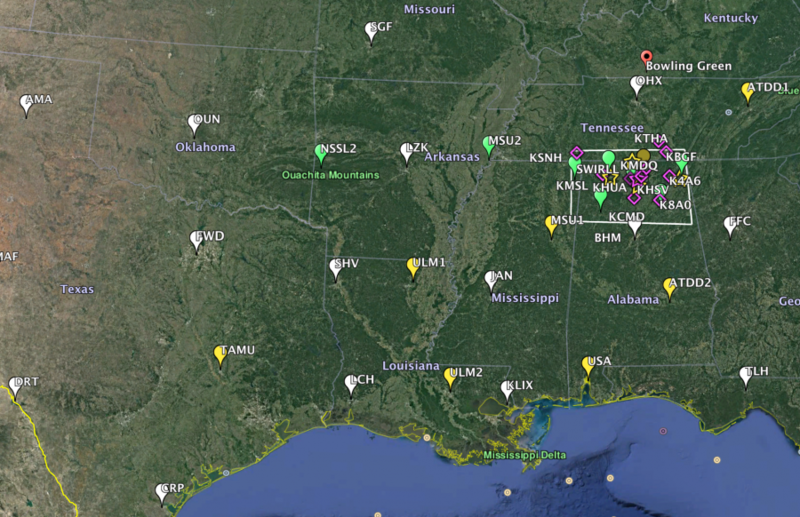 In parallel, VORTEX-SE is supporting a lot of research (some of it happening today in Alabama) into how people respond to tornado forecasts and what obstacles stand in the way of getting people into shelter locations that can withstand the expected tornado winds. As forecasts continue to improve, we ought to be able to help people make reasonable sheltering decisions even if their homes are too fragile to withstand typical tornado winds. I think I speak for most of the VORTEX-SE researchers in saying that tragedies like yesterday’s Lee County tornadoes hit us pretty hard. There’s no relishing or enjoyment. But that said, these events are the reason most of us do what we do, and motivate us to keep moving forward in this research. Posted in News on February 22, 2019 by erik.rasmussen@noaa.gov. 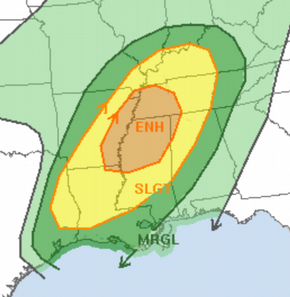 Some of the uncertainties with this system include the expected tornado intensity, the northern and southern extents of the threat, and how late into the evening on Saturday (and how far north and east) the activity will persist. Often with these systems that appear to have a pretty high threat, there is some unexpected or poorly understood aspect that ends up limiting the threat. These limits to the threat are as important to understand as the factors that come together to produce the threat. An additional complication with this system is the tremendous amount of rain and consequent flooding that has occurred, and will continue, across northern AL, TN, northern MS, and adjacent regions. These “multiple-hazard” events are not unusual in the Southeast, and complicate the work of all involved in the weather enterprise.